Bomb Squad is a real-time cooperative game in which you and your teammates go on missions to save people and disarm bombs. You only have so much time until the bombs detonate, though, so you have to work together to send your robots in the right direction. 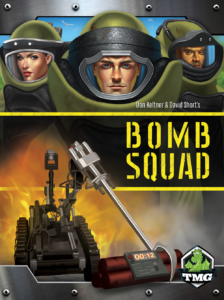 Bomb Squad was created by Dan Keltner and David Short, and published by Tasty Minstrel Games. Before you start playing Bomb Squad, you will need to choose one of the 14 missions to go on. Each mission will have its own map setup and objectives, and it will tell you which robot you will get to use. It will also tell you how much time you will have to complete the mission; you will use the Bomb Squad app to keep track of when the bombs will go off. Each player will get a role card that will give them special skills that they can use. 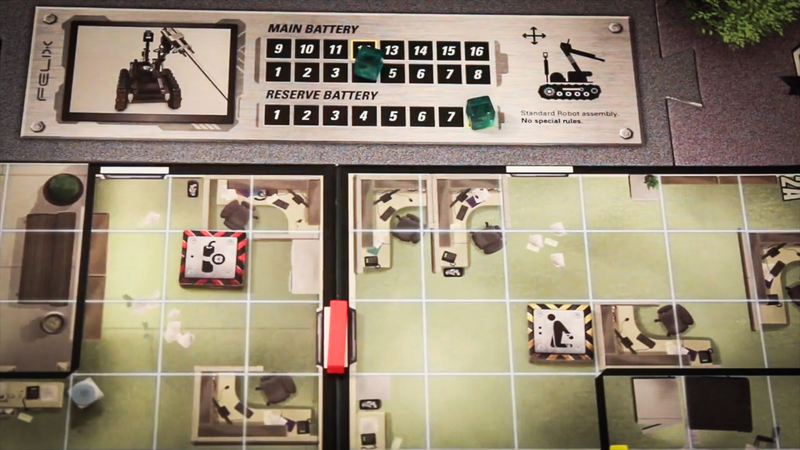 Throughout the game, you will be sending the robot around by using instruction cards. These cards will allow the robot to move, open doors, save hostages, and dismantle the bombs. You will be holding your cards away from you (Hanabi style) so only your teammates can see them. You will need to help each other by giving a little bit of information about the cards. For example, you can say that someone has three yellow cards, or you can say that they have two movement cards. As you learn about the cards in your hand, you will want to put them down beside the board so you can program your robot. One of the actions you can take later on is to execute the program and attempt to successfully move your robot around. Your robot only has so much battery, so you will also need to keep it charged. You do this by discarding cards and calling out what you think they are. If you are able to complete all of your mission’s objectives, then the whole team wins. If a bomb goes off (i.e., you run out of time) or your robot’s battery falls below zero, then the whole team loses. The game also comes with a a scoring chart so you can keep track of your high scores for each mission. If you’d like to read more about how to play Bomb Squad, check out the official Bomb Squad rules at BoardGameGeek. The tension! This is an intense game, but that’s a great thing considering the theme. If you have a group that enjoys role playing, you will probably have a lot of fun being members of a bomb squad. We also liked the challenge that later missions bring. Your chances of successfully completing them are low, which makes getting those wins that much more satisfying. It also forces you to improve your cooperative gaming skills, which is always a good thing to us. One downside that comes with a lot of cooperative board games is that “alpha gamers” can take over. You shouldn’t run into that issue with Bomb Squad since you’re on a clock and you’re not allowed to talk unless you’re giving clues. The tension! Some people just don’t like it and this game brings a lot of it. We actually like these types of games, but we totally understand those who simply want to relax and enjoy a board game. Bomb Squad is fun, but it’s definitely not a relaxing game. Bomb Squad is kind of like a mix of Hanabi, FUSE, and Flash Point: Fire Rescue all rolled into one, which is great since plenty of people like all three of those games. If you like real-time games and/or games with a ton of tension, then you will probably be a pretty big fan of this one. Bomb Squad isn’t a game that we’ll be playing all the time, but it’s definitely a keeper. All of our high scores are in the box, so it’ll be fun trying to beat them as the years go by. Thanks for taking the time to read our Bomb Squad review!